Not everybody out there can afford frequent sports massage, which is tailored to free body pain and muscles aches. If sports massage is not in your list as well, we can help you with an affordable alternative to take care of your body pain, muscle tension, cramps, and soreness that can prevent you from living your life to the fullest. As such, the title of this article already reveals the plot. Yes, we are going to talk about the best massage roller sticks out there on the market today. For those who don’t know, athletes across the globe have gravitated towards this highly functional and budgeted fitness rehab tool. 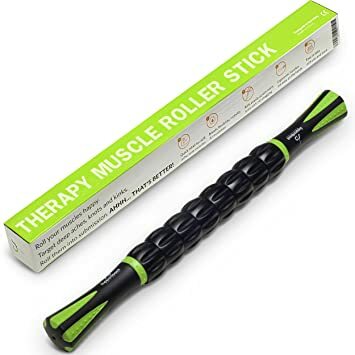 That said, you don’t need to a professional athlete to get one because anyone with a pulse can benefit from a massage roller stick. Before we reveal the best products in this department, let’s provide you with a general guideline on how to purchase the best massage roller stick out there without frying your brain. You will be committing a grave mistake by ordering a massage roller stick that you might have seen at your girlfriend’s house. If she is a professionally active person, she might have ordered something that best fits her needs. So, it won’t be a suitable product for you. If you are a beginner, choose something that’s soft and has a lower density in comparison to a massage stick used by a pro. Leave the firmer ones for the professionally advanced guys who desire deep penetration for best results. Don’t choose a massage roller stick that weighs a ton. Not only will you find it difficult to carry, but you will also experience difficulty using it. For you to have better control over the equipment, it should be light enough for easy maneuverability. Not to undermine the fact that a lightweight roller stick will help you cover a lot of territory more easily without any fuss. So, don’t stretch too much on the weight of the product. Don’t go for a generic brand because the products from these brands will most likely not last till eternity. You never know the company might be neck deep in debt. As a result, the product quality control might be loose as hell. You will hardly encounter such issues with branded products. Not to forget the fact that reputable brands usually back their massage roller sticks with a lengthy product warranty. The massage roller sticks of today come with different number of rollers on the stick. We have seen as much as fifteen rollers on a stick. We highly recommend that you don’t go beyond two to eight rollers. Go for a compact roller stick if you are a frequent traveler so that you can easily carry the gadget with you on a road trip. Larger ones can be considered if you are not going to move it from one location to another. Set your budget before you reach out to your wallet. This will help you narrow down the best products within your spending limit from the sea of choices out there. This is not essentially a buying tip. It’s just another important factor worth considering by future buyers out there. It has been observed that folks who don’t see quick results quit on the massage roller stick sooner than usual. What one should realize over here is that improvement in flexibility and mobility takes time. As a matter of fact, even muscle relaxation takes due time. Therefore, one should not always look for an overnight fix. It’s important to be patient with the results to start witnessing gradual changes in the body. If used properly with some degree of patience, a massage roller stick could prove to be one of the best health investments ever. 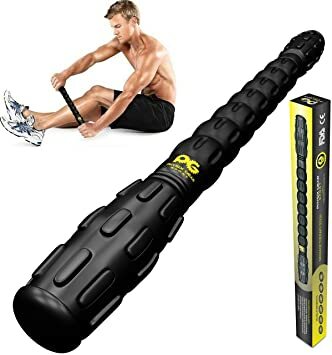 If you are looking for something that’s a few notches better than foam rollers and far less expensive than a visit to a therapist, you should give the Physix Gear Sport Muscle Roller Stick a try. Created from the highest-grade thermoplastic material, this highly compact and portable massage roller stick will provide you with immediate relief from both swelling and pain like no other tool out there. This training recovery tool is bound to make your muscles feel lighter, better, and healthier than before. Therefore, it would prove to be an excellent addition to your ‘self-help’ regime. The Physix Gear Sport Muscle Roller Stick is easy to use, and it comes with free eBooks, which have comprehensive information to look at. Everything about this brilliantly-sized tool will help you do your job to the highest possible standard by helping you deal with the physical wear and tear like nobody’s business, Basically, this affordable fitness gear offers convincing health benefits to ditch the therapist. Not to forget the fact that this is a far better solution than consuming those horrible-tasting pills. There’s no better and affordable way to loosen your tense muscles in today’s age and time. The Physix Gear Sport Muscle Roller Stick truly has no close seconds in its domain. Keep in mind that it’s not a torture tool. You have the flexibility to apply as much or as little pressure as you want. It definitely improves the blood flow to the treated body parts to help them relax and recover soon. This lightweight and portable muscle roller stick lets you massage your entire body without any fuss. It even reaches those awkward spots where other tools fail you. It’s well-built and sturdy enough to stand up well against your entire body weight. Plus, it’s compact and small enough to manipulate easily to effectively massage just about any body part you care to treat. To make it a risk-free affair for the consumers, Physix Gear Sport has stepped up to the plate over here by offering a 100 percent money back guarantee on their massage stick. If you are a first-timer, you might need assistance from someone to roll some parts of your back. That said, once the early days are gone, you will automatically get better at using this recovery tool. 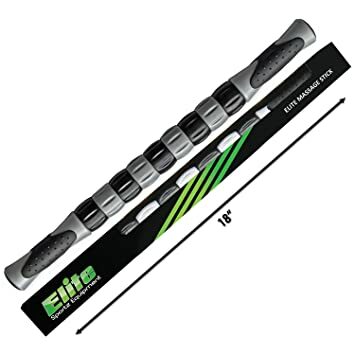 If you are looking for an affordable self-rehab tool, the Elite Sportz Equipment – Muscle Roller Stick 18 should be your fitness gear of choice. This magic stick can edge out its rivals on any given day of the week. It will not only help you with body pain and muscle soreness, but it will also improve your mobility. Believe us or not, your mobility will not be the same again. Just 10-15 minutes of daily use can do wonders for your health. If you are involved in any type of sport, this light and compact muscle roller stick should find a permanent place in your sports bag. This tool can be used before and after the exercise. It’s often recommended for injury rehab as well. So, it’s an all-purpose fitness tool that can prove to be an inexpensive alternative to physiotherapy. Not to undermine the fact that its light enough to be tried on any part of the body. Depending on your tolerance level, you can also control the amount of pressure you want to apply to the affected muscles. Plus, the grip on this thing is extremely sturdy. Frankly speaking, you would be hard-pressed to find a better tool than this one for relaxing your tight and irritable muscles. Not only does it roll easily, but it’s also comfortable on the skin. Unlike other recovery tools, this muscle roller stick works by applying pressure at the right spots without the need to awkwardly position yourself for rolling. The rolling action on this roller stick is extremely smooth. Credit for this goes to the smart product ergonomics. It’s cleverly built to prevent your hair from being pulled during use. It’s a convenient fitness gear to travel with. Given its compact size, it can easily fit into your gym bag or a traditional backpack without any fuss. Plus, it’s well-built enough to stand the test of time. The makers behind this muscle roller stick are willing to put their money where their mouth is. Yes, they offer a 100% percent money back assurance on this product. 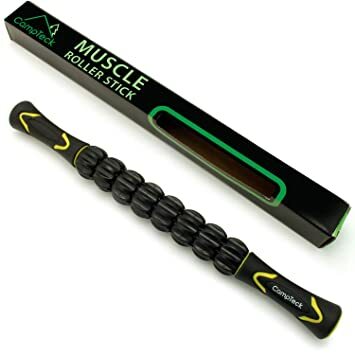 Although this Muscle Roller Stick has quality written all over its body, the packaging on this thing is not up to the mark. Simply put, the makers tried to cut corners with the product packaging, so it won’t sit well with your expectations. To warm up for any sporting activity or to recover from muscle tension, tightness, soreness, and pain, the ResultSport – Trigger Point Massage Stick will meet your expectations beautifully. It’s a highly useful self-massage tool that has been a great hit among fitness enthusiasts across the globe. For starters, this thing is dead easy to use, and you can target any body part with it that requires treatment. Simply put, this product provides you with an easy excuse to say goodbye to expensive sports massages. The best part is that the ResultSport – Trigger Point Massage Stick does the trick with very little effort on the user’s part. Yes, using this tool is not too much of hard work. Better yet, it provides immediate relief and drastically improves recovery time. Furthermore, it reduces muscle tension and stiffness in the days to come as well. Not to forget the fact that it’s much more portable than a foam roller or similar other tools in its category. For all these reasons, this massage roller stick has been a hit with the masses. The product comes with rubber handles for a good grip. And, the ResultSport massage stick features three independent rollers to help you target those hard to reach body parts. Unlike foam rollers and similar other competitive products, this one penetrates deeply for better results. It delivers almost the same effects of a deep sports massage at a budget. As hinted earlier, you won’t need seriously important life skills to use this rehab tool. With a physio helping you, this tool can also be used for major muscle injuries. Frankly speaking, it’s hard to find fault with a massage stick of this quality. That said, a simple user guide on how to use the massage stick effectively would have added some more feathers to the product’s cap. To speed up the slow process of getting back to normal life, the CampTeck Muscle Roller Stick could be the answer to your rehab prayers. It’s a really good rehab, recovery, warmup, and soreness relieving tool. It triggers blood circulation and eases muscle pain, cramps, and knots like a champ. Frankly speaking, it revitalizes your muscles more than icing, stretching, or any other similar imaginable stuff. Moreover, it offers immediate and long-lasting results without straining your tight budget. You will be amazed at how quickly this little thing can improve the quality of your sporting life. This product is very well put together to be less painful and more effective than similar other massage tools out there. Given the smart built, only you and not your entire body weight will control the amount of pressure to be delivered to the targeted muscles. As a result, you can press hard on the muscles without hurting them at all. This thing truly works like a treat. Well, it’s not equivalent to have a proper sports massage, but it’s definitely a second-best choice. It’s only 42cm long. It would effortlessly fit into your gym bag. Therefore, you can easily carry it with you whenever possible. Not only does it have the right size to it, but it also features convenient rubber handles for a good grip. Given how well-made the item is, you can use it on your back and other hard to reach spots as well without any assistance from your partner or someone else. It’s safe to use. It’s easier and better than its counterparts as well. Furthermore, it’s compact and strong enough to be easily carried and last for many years to come. It can be a tad bit painful at first. That said, one will know how to apply the right amount of pressure with due time. Therefore, we won’t hold a major grudge on this massage stick for the initial hiccup. If you want your partner to stop asking you to massage him/her after long hours at work or a labor-intensive sporting event, you can get him/her this self-massage roller stick. The goal is to give those troubled muscles some relief so that they don’t end up being sore or painful. And, this little tool gets the job done like a pro. It’s really good for those who train hard and feel the pain afterwards. If you are a particularly athletic person, this massage roller stick will pay you more than your money’s worth in no time. The product will prove to be your on-demand personal therapist. Given how well this massage roller stick is designed, you will have no problems getting in behind your legs, back, quads, or shoulders. So, the absurd human skeleton design won’t stop it from treating any body part that needs attention. Basically, it will go wherever it can possibly reach. The ergonomically shaped handles are a huge bonus too. They will make it relatively easy to target specific pressure points. It will send body soreness, pain, tightness, and tension on retreat mode. Given the massage stick’s efficiency, it’s truly easy to reap the full benefits of this product. It’s a really helpful tool for loosening up your muscles from the comforts of your home. This great little invention has an immediate effect on the targeted muscles. Moreover, its handy to use, and extremely portable to be easily carried along with you. This massage roller stick can be returned anytime within the first 30 days of purchase for a complete refund. To give credit where it’s due; we truly applaud the company for sweetening the deal with a money back guarantee. To make the most use of this wonderful tool, it’s a good idea to ask your coach to tell you how to go about using this roller stick. You can also ask a physio. Of course, the guy will charge you for the same because nothing comes free in today’s age and time.